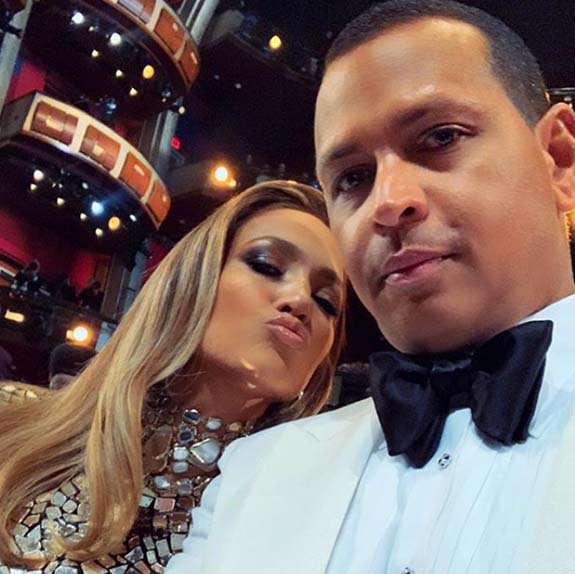 Back in 2001, Jennifer Lopez famously sang, “My love don’t cost a thing,” but that didn’t stop boyfriend Alex Rodriguez from spending upwards of $5 million for an eye-popping emerald-cut diamond engagement ring. The couple proudly displayed a romantic hand-in-hand photo of the ring on their respective Instagram pages Saturday. The former New York Yankee and 14-time All Star popped the question to the chart-topping performer and style icon while the two were vacationing at Baker’s Bay Golf & Ocean Club in the Northeastern Bahamas. A-Rod, 43, captioned his post, “She said yes,” and punctuated the phrase with a heart emoji. The simple, heartfelt message struck a chord with his followers and received more than one million Likes. The 49-year-old J. Lo, who claims 88.3 million followers on Instagram, captioned her version of the sweet photo with no words, just eight heart emojis. Her post earned 4.7 million Likes. The couple hasn’t revealed the weight of the diamond or the value of the ring, so jewelry-industry pundits were asked to offer their best guesses when questioned by leading fashion and celebrity websites. Overall, size estimates ranged from 10 to 20 carats, with price tags starting at $1 million and topping out at $5 million. The highest estimate was made with the assumption that the diamond is flawless. All the experts described the emerald-cut diamond as “classic,” a shape that was popular back in the 1920s, and is making a comeback. Included on the growing list of celebrities opting for emerald-cut diamonds are Amal Clooney and Beyoncé. Because the emerald-cut diamond is so spectacular, Rodriguez chose to go with a very simple setting, one that wouldn’t detract from the stone itself. The pundits also said that the elongated shape of the emerald-cut diamond accentuates the length of Lopez’s fingers. Lopez and Rodriguez have been dating for two years and each has two children from previous marriages. All the kids are between the ages of 10 and 14. This will be the fourth time Lopez has tied the knot. Rodriguez has been married one other time.